I dipped my toes into temperature-related research last week when I examined snow games, and that provided some clues that cold weather might lead teams to run the ball more often. In snow games, teams pass between 5 and 7 percent less often than they normally would, which is a bigger decrease than the 1 to 5 percent decline I determined that rain caused. Maybe the physical properties of snow account for that difference, but I suspect that the temperature difference between rain and snow might be the real culprit. So now it’s time to dive in and find out. All weather factors can change over the course of a game, but the work I did with the precipitation and wind data I pulled from ISD stations near football stadiums led me to simplify my research to game-level categories. A game could have moderate rain, light rain, or no rain. It could have gusts of wind up to 15 mph or up to 5 mph. Those labels were generalizations, but I felt I would have needed continuous, detailed weather readings within stadiums to try to break down the impact of precipitation and wind any further. With temperature, further breakdowns are possible. Not only do the ISD stations offer more consistently available readings of temperature than they do other weather factors, those temperature readings are also more consistent among the different weather stations near each stadium. That makes it easier to estimate temperature within points of a game. I came up with an approach to do just that for each quarter of every game. First, I estimated the window of time in which each quarter took place relative to the start time of the game. My approximation is that the second quarter starts 45 minutes after kickoff and ends 90 minutes after kickoff, that the third quarter starts 105 minutes after kickoff and ends 150 minutes after kickoff, and that the fourth quarter starts 150 minutes after kickoff and ends 195 minutes after kickoff. Then, I averaged all temperature readings near stadiums that were recorded between 1 hour prior to the start of each quarter and 1 hour after the end of each quarter. I excluded games played in a dome and any readings that also showed non-zero precipitation. When you group temperature readings that way, you can see some patterns that match up with intuition. For example, I noticed that day games with a 1 p.m. start time get a bit warmer over the course of the contest while night games that start at 8 p.m. or later get colder, between 2 and 3 degrees by the fourth quarter. 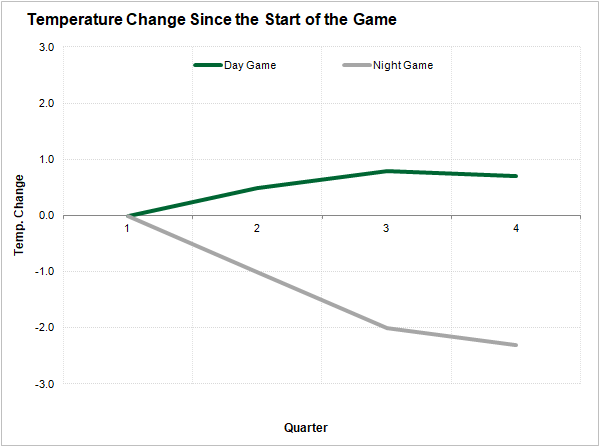 The close-to-3-degrees spread between day games and night games in fourth-quarter temperature relative to the temperature at start time may seem minimal, but keep in mind that is the average change. In extreme cases, the temperature can change by upward and even a bit beyond 10 degrees over the course of a game. That’s happened a few times in recent seasons and seems most common in late afternoon and night games in Denver as well as some northern cities like Green Bay. In my mind, 10-degree changes in a game could be significant enough to change a team’s play-calling, and so I decided to run my temperature testing split by quarter with an average temperature assigned to each quarter. However, I still wasn’t convinced temperature would have a major impact on team strategy or performance, so rather than start directly with more complicated weighted average calculations, I first simply grouped all plays run into some temperature groupings and calculated overall pass percentage. That showed temperature did play a small roll in team strategy. In quarters when my estimated temperature was greater than 50 degrees, pass percentage fell in a narrow range between 56.1 and 56.5 percent. When temperatures fell in the 30- to 50-degree range, pass percentage declined slightly to about 55 percent. Then, in the rare instances when the temperature fell below 30 degrees, there was another subtle decline to 54.1 percent. In the most extreme case of cold weather, pass percentage falls by about 2 percent compared to normal temperatures. That’s less than half the decline moderate rain brings and between half and a third of the decline snow brings — it actually neatly bridges the gap between rain and snow, as I theorized might be the case when I started this research. Still, a 2 percent decline in pass percentage is a pretty small concern for fantasy owners. In a typical game with 36 pass attempts, that is a bit less than 1 pass attempt lost. The real concern would be if cold weather impacted the performance of players on their attempts, and that does seem to be the case. Quarterbacks suffer a 1.8 percent decline in their completion percentage and 0.17-yard decline in their yards per attempt in cold-weather games and a 3.1 percent decline in completion percentage and 0.19-yard decline in their yards per attempt in below-freezing games. Over a typical game, that is in the ballpark of a 5- to 10-yard loss. Touchdowns and interceptions are unaffected. Running backs don’t see much of a change until the temperature falls below 30 degrees, but then they see a marked increase in their yards per carry of 0.26 yards. That neatly offsets the 5- to 10-yard passing decline, and it also matches up with the yard-per-carry increase I found running backs enjoyed in snow games. In fact, running backs see a bigger bump in their yards per carry average in clear, cold days than they do in snow games. That could be a relic of the small sample, but it does suggest that the colder temperatures matter more for running back production than precipitation does. I wonder if tacklers hit harder in warmer weather and that is responsible for this trend. Whatever the case, temperature alone clearly is a relevant performance factor separate from wind and precipitation.